The common goals of artificial intelligence (AI) in computer programs can be described as problem-solving and task completion. In general, these productivity enhancements are intended to either replace or complement human functions. In particular, AI has a significant transformative potential for most retailers, with a potential that's based on changes already underway within the retail industry, which are making AI apps more applicable. 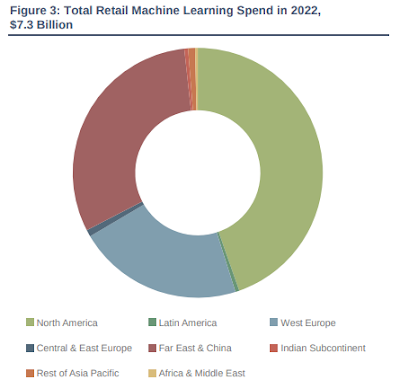 According to the latest worldwide market study by Juniper Research, global retailer spending on AI will reach $7.3 billion per year by 2022 -- that's up from an estimated $2 billion in 2018, as retailers target new avenues to increase personalization of the customer experience. The study found that retailers will heavily invest in AI tools that allow them to differentiate and improve the services they offer customers. These range from automated marketing platforms that generate tailored, timely offers, to chatbots that provide instant customer service. The Juniper market study also found that spending will be strongest in customer service and sentiment analytics, where AI can be applied to understand customer reaction to the products purchased and the service received. Juniper also predicted that savvy retailers will use AI insights to design and target new product ranges, as well as to create promotional offers. "Retailers are looking to replicate the success of Amazon in making AI a core part of their operations, with retailers increasingly turning to solutions such as AI-optimised pricing and discounting, as well as demand forecasting," said Nick Maynard, analyst at Juniper Research. The research found that AI-backed demand forecasting is increasingly becoming a key tool for retailers. With the advent of specific days for shopping, such as the Black Friday phenomena, understanding customer demand and correctly planning based on this is more important than ever. Juniper believes that retailers must invest in this area in order to stay competitive, particularly in low-margin retail segments. It noted that the cost of AI tools, currently uneconomical for many players, will drop by 8 percent over the next 4 years, helping realise a 300 percent increase in software spend.